Take out an ad in the programs of PNHS A Cappella concerts -- over 3,500 distributed! Plymouth North High School's mixed contemporary a cappella group, Northern Lights, is traveling to the United Kingdom this April to spread their music beyond the United States, and to help start an a cappella group made up of students from Plymouth, UK! Please consider supporting this once-in-a-lifetime trip! Your company’s ad will be printed in the programs for all PNHS A Cappella concerts for the 2018-2019 and 2019-2020 school years! This equals out to about 3,000 programs distributed! You will receive reserved, “Preferred Seating” tickets to all PNHS A Cappella concerts until June 2020. Preferred Seating at PNHS A Cappella Concerts (at Plymouth North High School) includes - 1 concession voucher per ticket, discounts on PNHS Vocal Music merchandise, & first priority seat choice! With your collaboration, we will design and print a 2.5’ x 6’ banner for your company, which will be displayed in the PNHS Performing Arts Center Foyer at each PNHS Vocal Music (a cappella and choral) event. In addition, Your company will be recognized verbally as sponsors at all possible Northern Lights events. Your company or organization will be given a table and space in the foyer of all PNHS Vocal Music events to advertise and engage with patrons. Your company’s logo will be featured on pnhs-sings.com, PNHS Vocal Music’s website, where concert attendees buy tickets to PNHS Vocal Music events and get info about our program. ​Your company’s logo will be featured in the PNHS Performing Arts Center Foyer on a board with other sponsors at each PNHS Vocal Music (a cappella and choral) event. 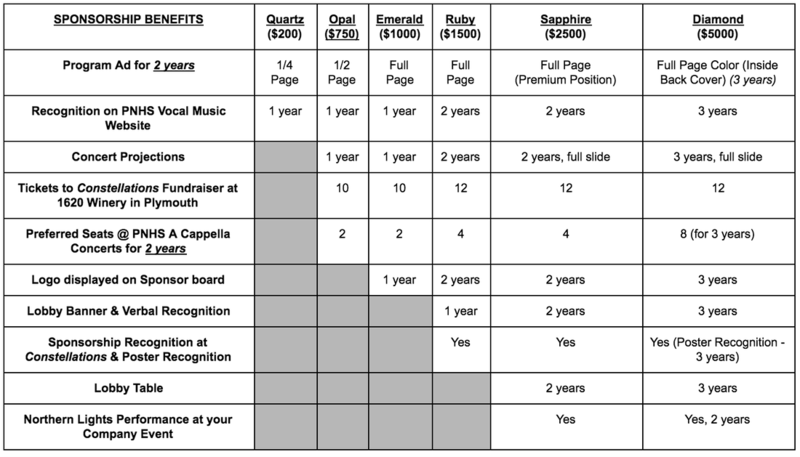 Your company’s ad will be placed in the program at Constellations, and your company’s name and/or logo will be printed on all posters for PNHS A Cappella concerts until June 2020. These posters are hung for 4-6 weeks before concerts.